Repossession is a process where an auto lender can take back possession of your vehicle, sometimes without warning you in advance or having permission from the court. 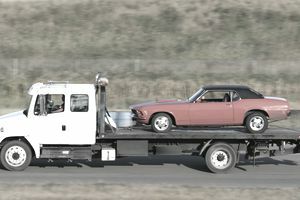 Vehicle repossession laws vary by state, but your vehicle purchase contract should include details about how and when your auto lender can repossess your vehicle. Repossession typically occurs after you fall behind on your auto loan payments. Depending on your contract, your lender may be able to start the repossession process after the first missed payment. There are two major types of repossession - voluntary and involuntary repossession. Voluntary repossession is when you give your car back to the lender, for example because you can no longer afford to make the monthly payments. When people talk about repossession, they're typically talking about involuntary repossession. This is when the lender the lender comes to take back the car. The lender can sometimes take the car from your property without your permission as long as they do not disturb you or your neighbors in the process. It's important to know that if your vehicle is repossessed - either voluntarily or involuntarily - your auto loan is not cancelled. You'll still owe the balance due on your loan even after the vehicle is repossessed. Your auto lender can continue to collect on the auto loan by calling you, sending letters, or using a third-party debt collector. They can even sue you for a deficiency judgment which will include the balance due on the loan and costs associated with repossessing the vehicle. Your lender may sell or auction your vehicle, but the price may not be enough to cover your loan. In that case, you're still on the hook for the remainder of the loan. Repossession hurts your credit score. In fact, it's one of the worst things that can happen to your credit, making your financial life more difficult for years to come. First, the late payments leading up to the repossession will damage your credit score once they're reported to the credit bureaus. Then, the repossession itself will be listed in the public records section of your credit report. If the lender obtains a deficiency judgment for the balance of the auto loan, that judgment will also go on your credit report. A collection associated with the deficiency judgment may also affect your credit score. A repossession is not the end of the world. You can rebuild your credit score and go on to qualify for another car loan in the future. If you're faced with a repossession, you might be tempted to give up on your credit completely. However, you shouldn't let all your other bills fall behind if you can afford to pay them. Timely payments on your other accounts will offset the damage from the repossession. You may be able to avoid a repossession by catching up on your delinquent payments. Talk to your lender to find out how much you need to pay to bring your account current again. While you’ll avoid having the repossession listed on your credit report, you may not be able to avoid the initial late payment entries that led to repossession. If your loan payments are too high, consider refinancing into a new car loan with more affordable payments. The refinance loan may lower your monthly payment with a longer repayment period, lower interest rate, or both. Because refinancing often requires you to have good credit, you should start trying to refinance your loan before you miss any payments. Missed payments may disqualify you for a refinance or if you do qualify, the loan terms may not get you into a lower monthly payment. Having a repossession will impact your credit significantly, but not forever. Paying off the remaining loan balance will look better on your credit report. Even if you can’t pay off the balance, the entry will drop off your credit report after seven years. In the meantime, protect your other credit accounts. Keep making timely payments on your other credit cards and loans to help your credit score rebound faster.